Seven Stories Press, 9781583229293, 560pp. For years, Derrick Jensen has asked his audiences, "Do you think this culture will undergo a voluntary transformation to a sane and sustainable way of life?" No one ever says yes. Deep Green Resistance starts where the environmental movement leaves off: industrial civilization is incompatible with life. Technology can't fix it, and shopping—no matter how green—won’t stop it. To save this planet, we need a serious resistance movement that can bring down the industrial economy. 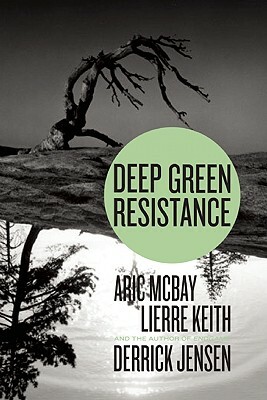 Deep Green Resistance evaluates strategic options for resistance, from nonviolence to guerrilla warfare, and the conditions required for those options to be successful. It provides an exploration of organizational structures, recruitment, security, and target selection for both aboveground and underground action. Deep Green Resistance also discusses a culture of resistance and the crucial support role that it can play. Deep Green Resistance is a plan of action for anyone determined to fight for this planet—and win. DERRICK JENSEN is the best-known voice of the deep ecology movement. Winner of numerous awards and honors including the Eric Hoffer Book Award, USA Today’s Critic’s Choice, and Press Action’s person of the Year, Jensen is the author of over fifteen books, including Endgame and Deep Green Resistance (with Aric McBay and Lierre Keith). Philosopher, teacher, and radical activist, he regularly rouses packed auditoriums across the country with his revolutionary spirit. Jensen holds degrees in creative writing and mineral engineering physics. He lives in Crescent City, California. Writer, activist, and small-scale organic farmer ARIC MCBAY works to share information about community sufficiency and off-the-grid skills. He is the author of Peak Oil Survival: Preparation for Life after Gridcrash and creator of "In the Wake: A Collective Manual-in-Progress for Outliving Civilization" (www.inthewake.org). LIERRE KEITH is a writer, small farmer, and radical feminist activist. She is the author of two novels, as well The Vegetarian Myth: Food, Justice, and Sustainability, which has been called "the most important ecological book of this generation." She's also been arrested six times. She lives in Humboldt County, CA.